If you are looking for the older calculator you can use it here. To find ALL projectors that meet your throw distance needs, search the Projector Database with your desired screen size and throw distance. How far do you put a projector from the screen? A projector's distance from a screen and the size of the image it produces are proportional to each other based on the optics of the lens. As you increase the distance between the projector and a screen the image will also increase. If your projector has a zoom lens, the lens can be adjusted to change the size of the screen image without changing the distance of the projector. 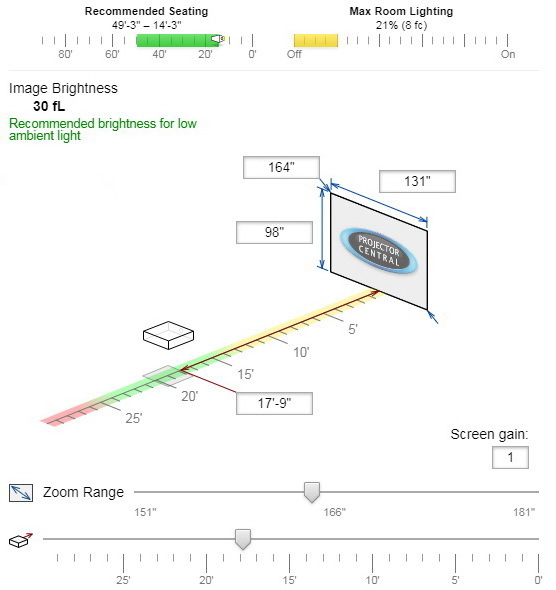 Since each projector lens is different, an online projection calculator tool will help you calculate the size of an image on a screen relative to how far the projector is placed from screen. What is a throw ratio for a projector? For any given projector, the width of the image (W) relative to the throw distance (D) is know as the throw ratio D/W or distance over width. So for example, the most common projector throw ratio is 2.0. This means that for each foot of image width, the projector needs to be 2 feet away or D/W = 2/1 = 2.0. So if I'm using a projector with a throw ratio of 2.0 and I have an image width of 5 feet, then my throw distance must be 10 feet. So the throw ratio is a simple formula that let's you easily compute throw distance or image width given that you know one of these measurements. A projector zoom lens will have two different throw ratios, one for the minimum zoom setting and one for the maximum zoom setting. What is considered a short throw projector? A short throw projector is a projector with a lens that has a throw ratio of 0.4 (distance/width) or less. These projectors are ideal for rear screen applications where the area behind the screen is limited, or for a wall mounted application where the projector will be mounted within 1 or 2 feet from the screen. The goal of these projectors is to produce as large of an image within the shortest amount of space between the projector and the screen.